Corral at Breckenridge is a condo complex in Breckenridge CO Real Estate on the south end of Main Street. A new exterior renovation was completed in November 2009, making this property feel and look brand new. Corral at Breckenridge was built between 1996 – 1999 and has a total of 65 residences. There are 4 – one bedrooms, 32 – two bedrooms, and 29 – three bedroom units with anywhere from 800 – 1540 square feet. 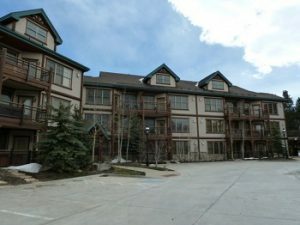 All of the Corral at Breckenridge condos have balconies, some of the residences have views of the ski slopes and a few of the units have private hot tubs on their decks/patios. If you are looking for a condo in Breckenridge Real Estate with amenities, look no further. The Corral at Breckenridge has elevators in every building, 2 fitness centers, oversized community hot tubs, a business center, meeting room, game room with a pool table, foosball, air hockey and a 55″ television. Some of the condos have detached garages, the units that don’t have a garage have the option of having large private lockers. The Corral at Breckenridge is within walking distance to the ski slopes at the base of Peak 9 of the Breckenridge Ski Resort and a few blocks from Breckenridge’s Main Street. Corral at Breckenridge is also within walking distance to the Stephen C. West Ice Arena. When viewing Summit County Real Estate take a look at the condos for sale in Breckenridge CO and the Corral at Breckenridge. To arrange your own private tour of the condos for sale at the Corral at Breckenridge or other properties in Summit County Real Estate, contact us today.